Stretching before aerobic exercise helps prevent injuries and improves coordination, especially insports such as diving and gymnastics where flexibility are essential. Stretching exercises should be done slowly until a mild tension is felt. Avoid quick, bouncing movements. Does it matter if you can’t touch your toes? You bet, especially for young athletes. The ability to bend and stretch easily without straining your joints and muscles not only protects you from injury, it improves coordination, reduces muscle tension, and helps you recover quickly after a vigorous workout. Methods therapy inversion will help you. 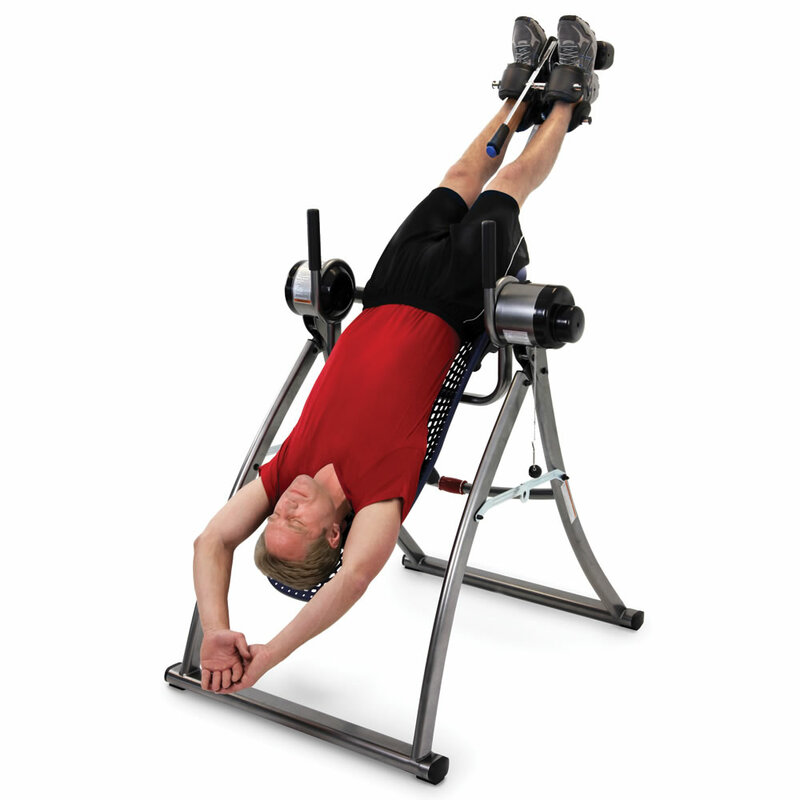 You can look for here inversion table reviews. Trouble is, most people tend to skip stretching. Compared to doing a sport, stretching can seem slow and boring. But when it comes to getting in shape and staying that way, flexibility training is as important as strength training or cardiovascular fitness. And it only takes about 10 minutes a day. Flexibility is more than just a matter of whether or not you can bend over to tie your laces. It also determines how well you maneuver around a court or rink, pitch a ball, or return a serve. The more flexible you are, the easier it is to bend and rotate through a full range of movement. That’s especially important in sports like gymnastics or diving, where your body needs to twist and turn in different directions at various speeds. Flexibility also protects you from injury. Shin splints, tennis elbow, and muscle stiffness, for example, are caused by tight, inflexible tissue surrounding the muscles and ligaments. Stretching, on the other hand, promotes the relaxation of the muscle fibers, making the muscle more elastic and flexible. Stretching also helps your body get rid of lactic acid, which causes fatigue and achiness. Watch a dog or cat stretch sometime. Animals instinctively know the secret of the perfect stretch. They always stretch just far enough to wake up their muscles, and never go past their limits. People do. When you force yourself to stretch further than you comfortably can, you risk damaging your joints and tearing your muscle fibers. The result is that it’ll take you longer to become flexible, since damaged muscles take time to repair themselves. Another way to “overstretch” is to stretch cold, without a warm-up. Stretching “tells” your muscles they are about to be used and should be included in your exercise warm-up. It’s important to jog in place or jump rope first, to raise your core body temperature and get your blood flowing. Warm muscles respond better to stretching than cold ones. After your workout, stretching helps reduce cramping, tightening, and soreness in fatigued muscles. There are two phases to a proper stretch: easy and developmental. You start by stretching to the point where you feel light “pins and needles”; relax and hold the position for 10 to 30 seconds. The mild tension you feel in your muscles should go away as you hold the stretch. If it doesn’t, ease off slightly, then, move a fraction of an inch further and hold the position again. Both phases should be slow and controlled. Quick, bouncy movements tighten the muscles rather than loosen and relax them. So does stretching to the point where you can’t breathe, or where you feel sudden pain. If you’re tighter on one side of your body than the other, be sure to stretch that side first. You’ll loosen up a lot quicker that way. Don’t forget to breathe. Proper breathing lets your body get rid of lactic acid and other by-products of exercise and gives your muscles needed oxygen. Whenever you stretch, focus your attention on the muscles you’re working, and don’t try to stretch too many of them at once. Isolating a single muscle or muscle group gives you more control over the stretch and allows you to concentrate more on relaxing and on your breathing. Generally the fewer muscles you try to stretch at once, the better. That’s one reason that “the splits,” which stretches several different muscle groups in both legs at once, is not recommended. Stretches like the straight-legged toe touch, back-bend, and upside-down stretches also are considered risky, and they shouldn’t be done unless you are an advanced athlete or are coached by a qualified trainer or physical therapist. When you’re putting together a routine, stretch your back first and include stretches for your neck, shoulders, waist, hamstrings (muscles in the back of the legs), thigh, groin, Achilles tendon, and abdominal muscles. Tailor your routine to your body shape and to your particular sport. If you playhockey, for instance, you may want to emphasize the quadriceps and knees; if you’re a pitcher, add stretches for the arms and upper body. Above all, remember that stretching isn’t supposed to hurt. If it does, you’re doing something wrong. Expect a little soreness at first, especially if stretching is new to your exercise routine. But never keep exercising if you feel or hear anything tearing or popping. The key is to relax and be patient. It takes time to loosen up tight muscles that haven’t been stretched in a while. Luckily, stretching is something you can do anytime waiting for a bus, after a long hike, or while you’re watching TV. If you need a little inspiration, take your cue from the nearest dog or cat. * Stretch slowly to the point of slight discomfort and hold the position. * Include at least one exercise for each major muscle group. * Warm up before stretching. * Include stretching in a cool-down routine. * Stretch to suit your sport and your body shape. * Think about the area being stretched–it gets you in touch with your body and sharpens your concentration. * hold your breath. It starves your muscles of oxygen.